The Care Quality Commission (CQC) is a taxpayer-funded body responsible for regulating health and adult social care services (provided either by the NHS, local authorities, private companies or voluntary organisations) in England. All establishments where health-care professionals (e.g. doctor, nurse etc.) undertake certain 'regulated activities' must register with the CQC under the Health and Social Care Act 2008 (Regulated Activities) Regulations 2010. 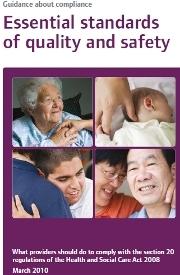 The 2010 'Essential Standards for Quality and Safety' sets out what the CQC would expect providers to do in order to comply with the regulations. Taking published guidance into account. The last point emphasises the value of appointing a 'laser protection adviser', LPA) and providing suitable laser safety training for all staff involved with lasers.